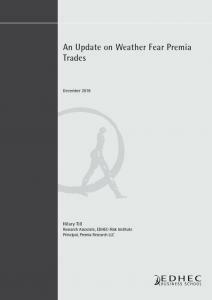 In this article, we will review a class of trading strategies known as “weather fear premia” trades. We will describe them, arguing that they may comprise a type of risk premium and noting the extra diligence needed in their risk management. We note that both superior trade construction and an analysis of fundamentals are also critical for the successful implementation of these types of trades. We conclude with a cautionary note on a catastrophic trading blow-up that occurred in November 2018, illustrating the risk of such strategies.